Choosing a theme is kinda a big deal. A theme determines the overall feel your site is going to have. 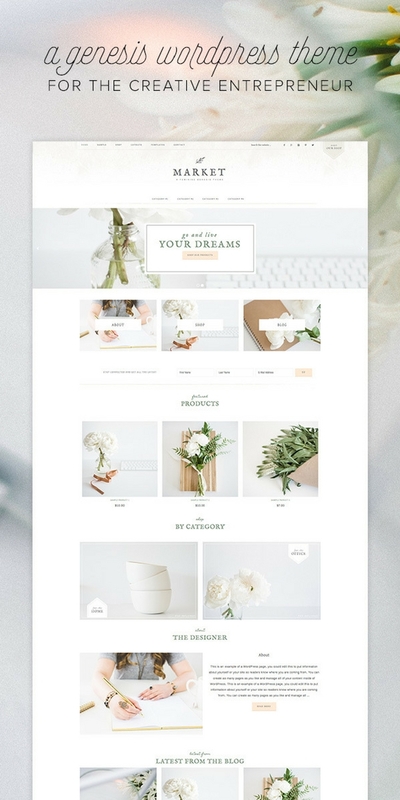 Choosing the right one can also mean the difference between a site that’s easy to navigate or one that ends up feeling like a scattered mess.With themes, there are SO MANY OPTIONS! You could spend months just going through them all. But don’t do that. My suggestion is to invest a bit of money now, commit to one really great theme for a year or so, and then make enough money that you can hire someone to design your site for you! Who knows, you may end up loving your theme and keeping it for the long haul. Crazy right. 1 in 5 Moms! That is a lot of mom blogs. And the blogs look great. 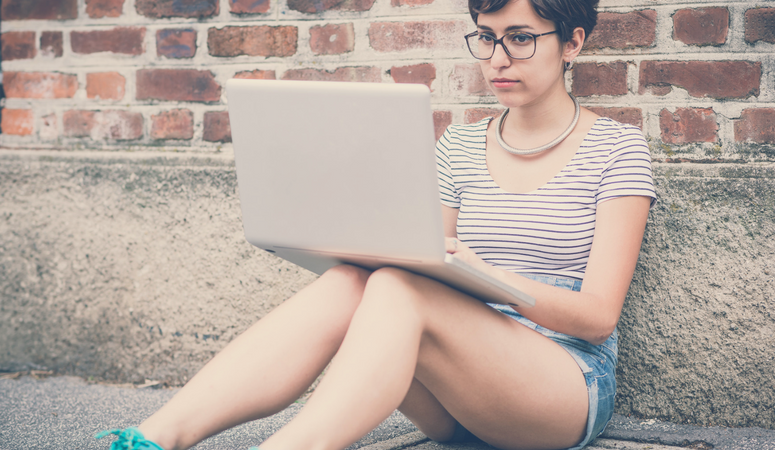 So even if you have the most amazing information, people expect a great looking blog as well. Without it, no one will stick around long enough to even read all the great info you are putting out there! So what makes a good theme? If your theme allows you to do all that, your good! Some of it may sound overwhelming right now, but it will become clearer, and in a couple months, you’ll be a pro. Plus I’ll explain more in-depth as we go. Yes. There are lots of free options. A free option can be a good start if you absolutely cannot afford a paid theme right now. WordPress comes with a few preinstalled options you can use for free. You can also go to the marketplace and look for a free theme. Free themes are not great for the long run though. There usually isn’t much support with them, and updating can be glitchy. I recommend going with a paid theme as soon as you can. There are two major types of themes in my opinion that I would consider when choosing a theme. One would be a prestructured theme, the other a theme builder platform like elegant themes. A prestructured theme platform is a platform that is built for you, and you can adjust and make minor changes. It does usually require some setup. You can pay someone to do this, but honestly, it’s not hard when you purchase it from a company with good supporting walkthroughs. I highly suggest Genesis with a child theme that you like. Genesis is the “it” platform for themes. Think of it like the frame of the house. When you get Genesis, it creates a solid framework for your “child theme.” Broken down further this is how it works. You get Genesis and install onto your WordPress site. Then you pick your child theme, and it makes it “pretty.” You know, the wallpaper and granite counters. Genesis is great because it is designed to be easily customizable, is search engine optimized (which allows people to actually find your site), is constantly updated (which means it is keeping up with the changes of the internet), has great support, and lots of great designers who have developed so many amazing child themes that look and function amazingly. You can read more about why Genesis is great here. There is also one, very big advantage to using a child-parent theme combo. 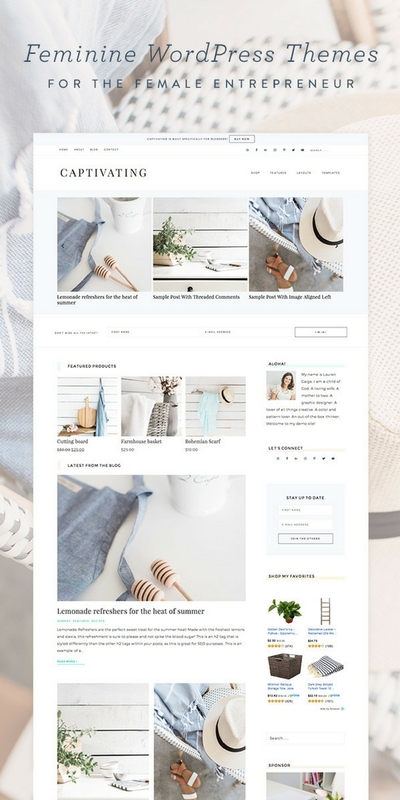 You can customize your child theme as much as you want, getting your site to look exactly how you want, and still get to update your parent theme without losing all your hard work. (I didn’t even realize that was a thing when I started.) I have spent hours customizing my theme, and I would be very upset if I had to update it, and lose all that hard work! Studiopress is the maker of Genesis. They also sell a bunch of child themes at great prices. Some of the themes on Studiopress are made by Studiopress, and some are from third-party sites. You can check them all out here. They have a large variety of themes to choose from, from simple and classy to pretty and feminine. Here are some examples of great Studiopress themes. All offering different looks and feels, but still clean and professional. 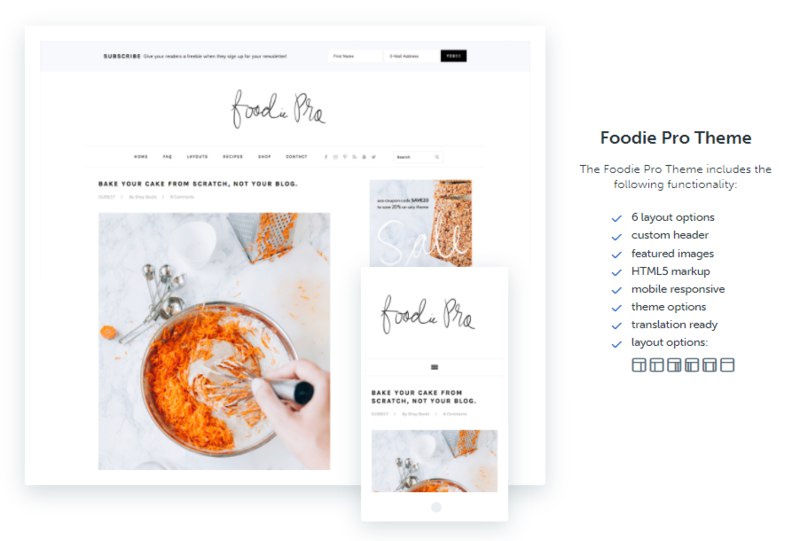 Foodie Pro: Great for food bloggers, but would work for other blogs too! Beautiful, easy to follow navigation. Puts feature photos front and center. Great for showcasing recipes and projects. Plus, so many different layout options! 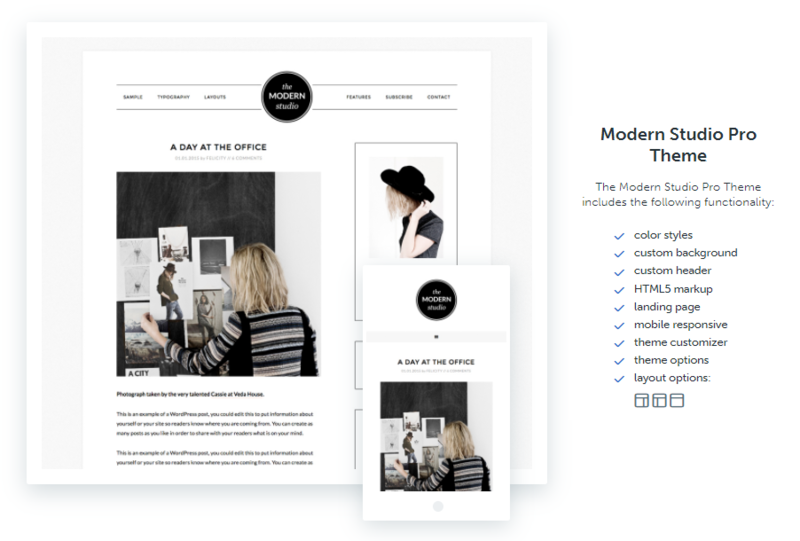 Modern Studio Pro: Great for lifestyle bloggers. Showcase who you are, and what you do! Beautiful and sleep design. Can be as masculine or girly as you like. It’s also very affordable as far as themes go. 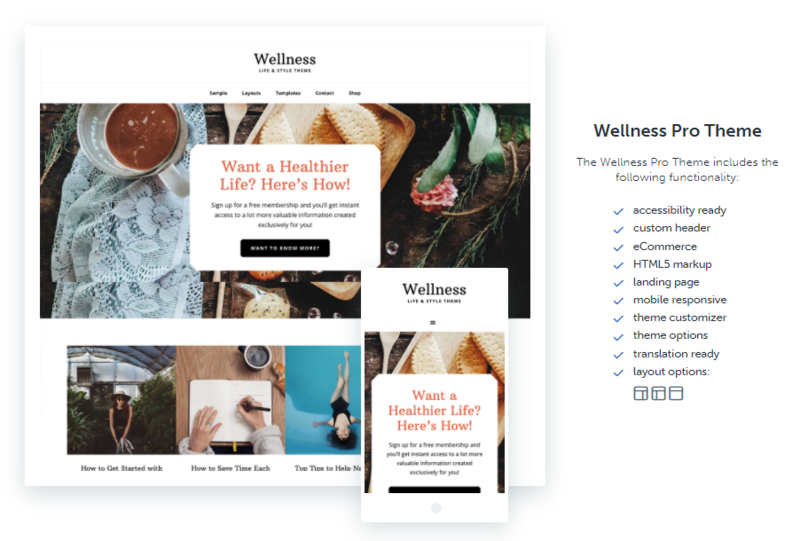 Wellness Pro: This theme was designed for health and wellness bloggers in mind. It’s great as it has a clear call to action (See the sign-up button in the white box at the top.) It also is sleek, and even has the ability for eCommerce in case you descide to sell products on your site. (This is one of my personal favorites I’ve been eyeing for a while.) These are just a few of my personal favorites from Studiopress. You can see the full list here. Studiopress is a great place to buy your themes because they offer amazing support. (I purchased 2 themes before for a different website, and they just didn’t work for my needs. They refunded the purchases instantly!) But they also have walkthrough tutorials on setting up your themes so you can get your site looking great quickly. I cannot stress how important these walkthroughs were for me to get started! Restored 316 is one of my favorite child theme shops! I may be biased as my theme is currently from them. I’m using their darling theme. What I love most about restored 316 is their theme documentation. This means that every one of their themes, has a whole section of their site dedicated to showing you how to set it up, ways to customize it for your needs, even showcases other sites that use the theme, each in their own way. 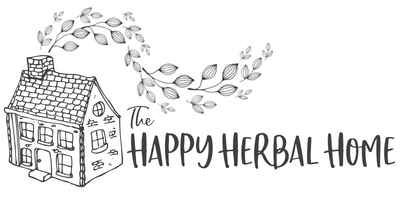 There is even a super useful Facebook group page where you can ask questions and get help from other knowledgeable users! 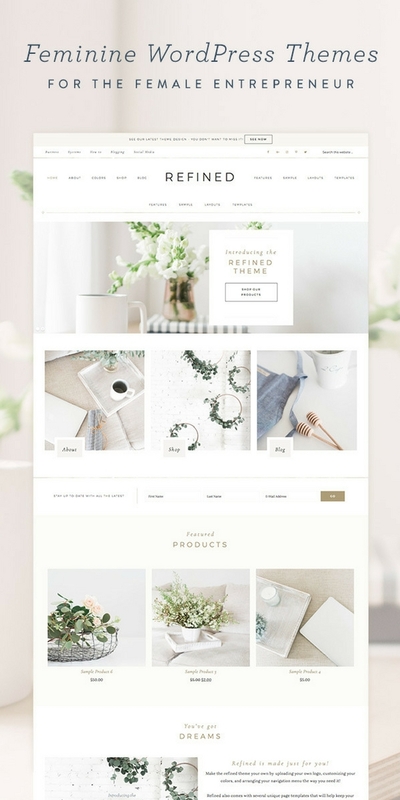 Market: This theme is great for the creative to market their goods. You can display product well, or customize it to fit any blog niche though. It’s beautifully laid out, and makes it easy to point your readers to what pages and posts you want to highlight.